Crossfit is the new kid on the block and seems to have attracted both the super competitive, and let’s be honest … the super smug. “Oh yeah, I just did 500 pull-ups and ran 5 miles before a healthy paleo breakfast” yeah you have probably met at least one example of this if you’ve ever attempted to join a CrossFit box. Compared to bodybuilding, CrossFit is in its infancy. Whatever you find annoying about CrossFit you’ll also find in the bodybuilding community. Smugness? Yeah there’s a LOT of that around, hyper-competitive people? Ditto. Guys clearly taking steroids but having to tell the world that they just take a lot of protein? Please. Both CrossFit and bodybuilding have their critics, but they both provide many men and women with exactly the right kind of motivation to excel in the gym, and that can only be a good thing. Both disciplines will help improve your strength, endurance, body composition, and health, but which is better? The purpose of this article is to compare the two and see which sport wins. 1 CrossFit or Bodybuilding for Building Mass? 2 CrossFit or Bodybuilding for Building Strength? 3 CrossFit or Bodybuilding for Fat Loss? 6 Bodybuilding Vs CrossFit Physique. Which is best? CrossFit or Bodybuilding for Building Mass? This first comparison of the two disciplines is perhaps a bit ridiculous. CrossFit is a sport that focuses on combining cardio and resistance training (known as cross training). It’s aimed at burning fat, improving cardio, and also improving strength. You will get some hypertrophy when Crossfitting, but compared to bodybuilding the difference will be small. Bodybuilding is a sport that is dedicated to the sole goal of building mass while maintaining an aesthetic physique (though this way of thinking is increasingly rare as mass monsters dominate the sport). If your goal is to build mass then you should pick bodybuilding hands down. CrossFit or Bodybuilding for Building Strength? If the first debate was quite straightforward, the following debate is going to be a lot less clear cut. Traditional bodybuilding is concerned mostly with building aesthetic physiques and prioritising muscle size over strength. Unlike in a sport such as powerlifting, bodybuilders are uninterested in beating personal strength records. They keep their rep ranges higher, targeting muscle fatigue and muscle damage. That’s not to say that bodybuilders aren’t strong though, particularly the professional ones. Arnold Schwarzenegger, Franco Columbu, and many other golden era bodybuilders held records in powerlifting too. It seems that there is a lot of crossover between bodybuilding and strength training, the main difference is rep ranges, and mentality. A strength athlete is concerned with reaching new weight lifting records, while a bodybuilder is concerned with symmetry, size, and aesthetics. CrossFit on the other hand has many similarities with powerlifting and Olympic weightlifting. There is a huge focus on personal records, and many CrossFit classes spend a lot of time teaching deadlifts, squats, and the main Olympic lifts. However, CrossFit is mostly focused on the idea of overall fitness. You need to be strong, but you also need explosive power, athleticism, endurance, speed, agility, and many other abilities. CrossFit members are looking for a kind of balance. They want to be strong but not so strong that it affects their athleticism, they want to be powerful, but also need to train for endurance. This can affect how strong they are overall. To decide which discipline is best for strength, we should compare two of the best performers, one from bodybuilding and one from CrossFit. Let’s say, Arnold Schwarzenegger and Rich Froning. We’ll compare deadlifts as these are often seen as the universal sign of serious strength. While you might think it unfair to compare two athletes who weigh different amounts remember that their relative size reflects (in part) their choice of sport. Rich Froning is without a doubt the most successful Crossfit performer of all time, while Arnold is the 3rd most successful bodybuilder of all time. This comparison is as fair as it is ever going to be. CrossFit or Bodybuilding for Fat Loss? Now we’re really getting into it, on the one hand, CrossFit was pretty much designed to be the ultimate fat burning sport. Combining heavy resistance training with high intensity cardio is a recipe for calorie burning. On the other hand is there anyone on earth who is more lean than a professional bodybuilder? No, there is not. 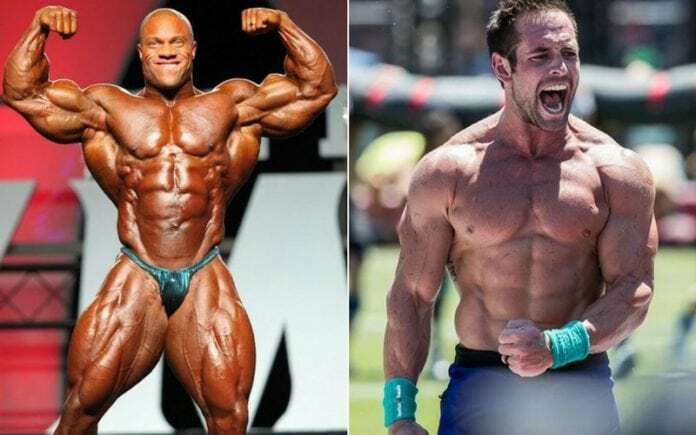 If this article was aimed at professional bodybuilders and Crossfitters you would have to say that bodybuilding is better for fat loss, because it has a better track record of getting its athletes to be incredibly lean. The cutting phase in bodybuilding is probably the ultimate fat burning tactic out there. Whereas CrossFit athletes are not aiming to get quite so lean. Yes, they look pretty ripped but they’ll still have some body fat when they are competing. It is not in a CrossFit performer’s best interests to get their body fat percentage below 7%. But if you are a slightly overweight person, and needed to lose weight in as fast a time as possible (without setting your sights on professionalism) which sport would you be best suited to? Now if you had a certain level of fitness already you’d have to say CrossFit. The workouts are intense, and the combination of weights and cardio will torch fat like nobody’s business. However, if you are completely new to lifting you’d probably find bodybuilding a gentler introduction to fitness. CrossFit is very extreme, and while bodybuilding can also be extreme, it often starts at a much more sedate pace. CrossFit has a bit of a reputation for being a major cause of injuries among its participants, while bodybuilding usually avoids this same level of scrutiny. But it’s all down to whether you are performing the exercises correctly in either discipline. Many professional bodybuilders have seriously injured themselves and been forced to retire through injury. Ronnie Coleman is pretty much wheelchair bound at the moment after a lifetime of bodybuilding. Dorian Yates had to retire prematurely due to chronic injury. Then there are the thousands of amateur bodybuilders nursing long term and short term injuries. CrossFit on the other hand tends to be similar in terms of injuries to the professional athletes. With lots of former Crossfitters and current Crossfitters fighting long and short term injuries too. Where the two sports differ, is in the injury risk for new lifters. Starting out in bodybuilding can of course lead to injury if you perform an exercise with poor technique, or use too much weight. But you are using medium weights and you’re supposed to be concentrating on technique and tempo, with adequate rest in between sets. CrossFit on the other hand combines high intensity interval training, Olympic weightlifting, plyometrics, and many other difficult, technical, and potentially dangerous movements. One of the biggest issues in CrossFit is the lack of individualism. In bodybuilding, you are often training alone or with a single partner. You can customise your workouts to suit your needs, and ability. You have a lot of control over what happens, and you have the opportunity to ease yourself into training. In CrossFit, you are in a competitive environment, where up to 50 people can all be exercising at the same time. The exercises are sometimes edited to suit different experience and fitness levels. But even so, exercises such as box jumps are often given to relatively new athletes. Plyometrics (also known as jump training) has definitely been underestimated by the CrossFit hierarchy. It is an incredibly intense and complex series of movements that can massively improve power, but can also cause injury in people who are not conditioned for it. A famous plyometrics book recommends that nobody start using plyometrics until they can safely squat double their own body weight! This is probably overkill, but it should give you an idea of how intense plyometrics is. But it is usually one of the first exercises that a new CrossFit member will learn, and the technique is often poor. This is because CrossFit usually prioritises quantity over quality. This is the exact opposite of what you want if avoiding injury is your biggest concern (hint: It should be). The standard of CrossFit instructors is definitely increasing. But there are still a lot of coaches who are barely qualified to teach a Zumba class, but have hundreds of people under their wing. The large numbers of people makes it impossible for even a really good coach to supervise individuals properly, and a bad coach won’t be able to do that at all. Combine all of this and it is no surprise that CrossFit has a reputation for keeping physios in business. Verdict: Bodybuilding is the safer option, but either sport is fine provided you learn how to do it correctly. Diet can be such a unique thing and definitely differs from person to person. So it is a little hard to decide which sport has a better diet. Bodybuilding tends to follow calorie tracking, and is further divided between if it fits your macros (IIFYM) also known as flexible dieting, and a more rigid form of “clean eating” where you avoid “processed foods” and mostly eat chicken, rice, and broccoli. CrossFit is usually combined with a paleo diet, which is a form of clean eating where you only eat food that would theoretically be available to our Palaeolithic ancestors. Of course, not many cavemen had access to avocados from Mexico and salmon from Scotland but that’s an issue for another day. Both sports have a lot of followers who use sensible dieting techniques, and both sports have a lot of followers who have insane dieting techniques (bulletproof coffee anyone?). It’s hard to say which is better or worse. As any diet can be effective for one person and impossible for someone else to follow. Verdict: A tie. Both sports are associated with disciplined eating and lots of fruit, vegetables, and protein, so at the end of the day either is fine. Just don’t get caught up in a crazy diet! Bodybuilding Vs CrossFit Physique. Which is best? This is definitely down to personal opinion, some people love the bodybuilder look. While others are repulsed by it. Personally, we prefer the CrossFit physique for men and women. However, there are a lot of bodybuilders over the years who have created incredible, jaw dropping physiques. Frank Zane at his peak, Serge Nubret, Arnold Schwarzenegger, we defy anyone to look at their bodies and argue that they don’t look incredible. At its best bodybuilding created physiques that inspired the public. CrossFit has not quite reached that level. Then again, modern bodybuilding has gone down the “mass monsters” road since Dorian Yates entered the scene. These days the average man or woman on the street is not inspired by the Mr Olympia winners, but see them as a form of freak. CrossFit athletes are probably seen as having a much more desirable physique now. Even though the most famous CrossFit performers are basically professional athletes, many people in the public can still imagine being them. At its peak, bodybuilding had that and now it doesn’t. Whether CrossFit or bodybuilding is better than the other should be of no interest to you (apologies for that). You need to decide which one is currently in line with your desires, and your personality type. CrossFit is more than anything a group activity. It’s about working alongside your friends and trying to beat your best score. Yes, there is a lot of competition too, but you all cheer each other on at the end. Bodybuilding is more of an individual hobby, sure you can train with friends, but most don’t. You will tailor your program and diet to suit your individual needs, and you are competing against yourself more than anything. Bodybuilding is also a more subjective sport than CrossFit. At the end of the CrossFit games, there will be a clear winner, while bodybuilding competitions are decided by the judges’ personal taste. Whichever you choose, make sure that you enjoy it. Work hard, hit your protein targets, and make some friends. You might find that you don’t like either sport, and that’s fine too. You can just train for your own goals … or eat 10,000 calories per day and become a powerlifter! Training with poor form has plenty of risks, which is why crossfit has such a bad reputation. However, its got to be better than sitting on your arse all day? Anything that gets people up and about has got to be good right? I always wondered which is better crossfit or bodybuilding and I am still looking. Talk about sitting on the fence! Are crossfit athletes really the fittest on earth? They talk a good game, but what is the truth? There is no doubt that those at the top of their game are incredibly fit. But the fittest on earth? Probably not. I always wondered why is CrossFit so popular? I guess it really depends on your end goal I suppose. If you want fitness rather than beach muscles then I guess that Crossfit would be the better option.